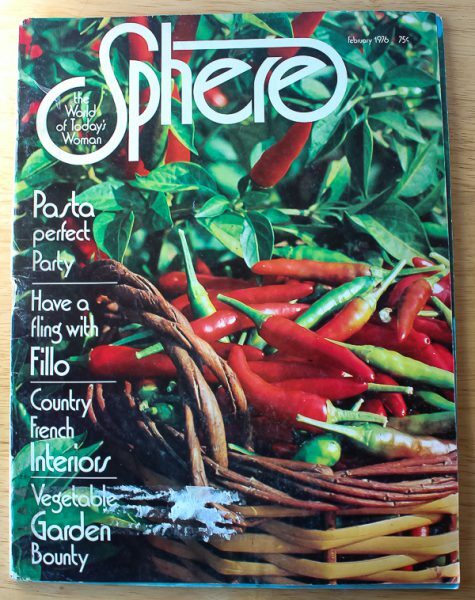 The Sphere February 1976 issue begins with an article on making homemade pasta and then throwing a big party to enjoy it with friends and family. The Pasta Party Menu starts with a Campari punch and Bagna Cauda Dip. There are recipes for sauces to serve over the pasta: Bolognese Ragu, sausage, white clam, shrimp and artichoke, zucchini-basil, tomato-vegetable, cold tomato-sweet pepper, or pesto. Pick one or offer a variety for the party. The meal ends with a spiced coffee ice drizzled with Amaretto. I’ll go to that party! The next article is all recipes using phyllo dough from appetizers to dessert, such as mushroom bites, shrimp rolls, savory French pastries, baklava, apple strudel, and a savory lamb and spinach main dish. Up next is a “Chicken Sampler” of crispy drumsticks, chicken breasts Alfredo, roast chicken, Mediterranean herb, chicken and dumplings, soup, and chicken wings. 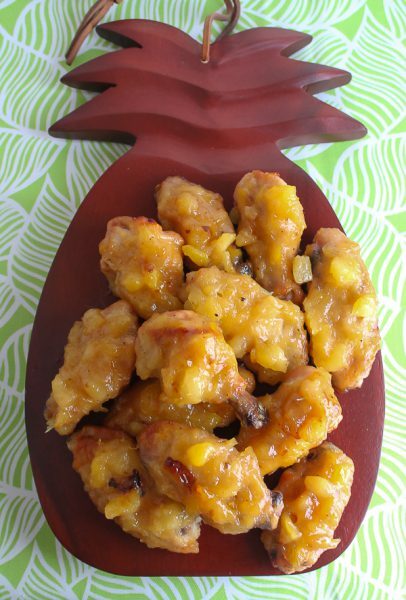 I decided to make the Sweet-Sour Chicken Wings because it would be something fun to have while watching the Olympics this month, and in addition, it also happens to be National Canned Food Month. They are so easy to make and completely addictive! 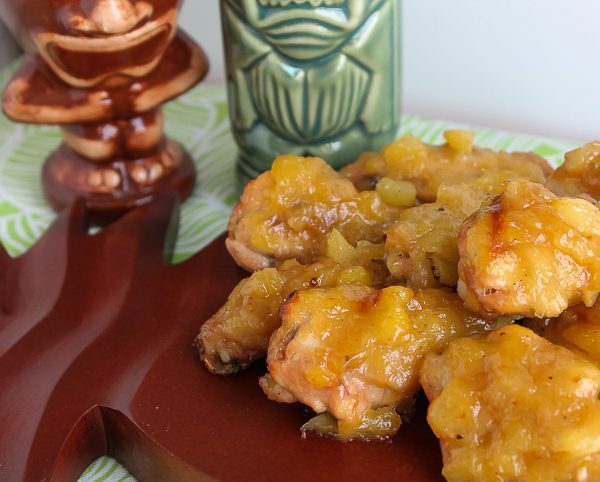 They have just the right amount of sweet-sour with the canned crushed pineapple, brown sugar, vinegar, and a dash of cayenne. We loved them! The 5-minute sauce is made in one pot, with half of it baked on the wings for about 30 minutes, turned, then topped with the rest of the sauce another 30 minutes. So easy and good. Here’s an Olympic story for you: My husband Bill, who is a structural and civil engineer in addition to being a certified house inspector, went on a job a few weeks ago and met one of Olympic ice skater Bradie Tennell’s coaches, who Bill said was so nice and a former Olympic skater himself. If you have been keeping up with the skating, you probably know how incredible Bradie is and doing great. She’s a real joy to watch. So make some wings and look for Bradie. And cross fingers for a Gold medal! Drain pineapple but reserve syrup. Add enough water to drained syrup to measure 1 cup; pour into a small saucepan. Add brown sugar, vinegar, dry mustard, salt, pepper, and cayenne. Combine cornstarch with the 2 Tablespoons water and add to saucepan. Cook and stir over medium heat until thick and glossy, about 5 minutes. Stir in crushed pineapple. Place wings in a baking dish large enough to have wings flat and not overlapping. Spoon on half the sauce. Bake uncovered for 30 minutes. Turn wings and spoon on remaining sauce. Bake uncovered another 30 minutes until wings are tender. Serve immediately. Serves 4. These look yummy Debbie! I copied this recipe too!!!!! Glad you enjoyed it, Dawn!